I note that Morales distinguished between coca, which may have other uses little publicized in the US, and cocaine and "coca paste". 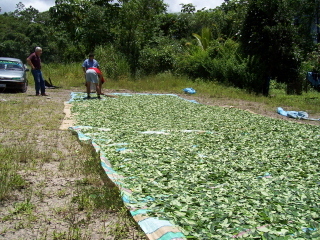 Can coca leaf be smoked, and would this be a relatively harmless method of use compared to highly concentrated pHARMaceutical cocaine? Would residents of US obtain any benefit from chewing coca leaf, as some Bolivians are said to do? If US cannabis legalization, the Postponed Experiment, might succeed in drastically reducing demand for cocaine but only at the "cost" of also drastically reducing demand for hot burning overdose $$$igarettes, does this explain the political opposition to it, especially among Republican candidates who receive the most tobackgo industry money? Its really a sad news to know that Bolivia, Burma, and Venezuela are not cooperating in anti-drug fight. It is must to ban the use of drugs in all countries and here America fails to do this. My opinion is that the use of drug to be vanished immediately. I am genuinely delighted to read this webpage posts which consists of plenty of valuable data, thanks for providing these kinds of information. Hey there! I know this is kind of off topic but I was wondering which blog platform are you using for this site? I'm getting tired of Wordpress because I've had problems with hackers and I'm looking at options for another platform. I would be fantastic if you could point me in the direction of a good platform. I'm not certain the place you're getting your info, however great topic. I needs to spend a while finding out much more or working out more. Thank you for magnificent info I was searching for this information for my mission. Hi there, the whole thing is going fine here and ofcourse every one is sharing information, that's genuinely good, keep up writing. I am now not certain where you are getting your info, however good topic. I must spend a while finding out more or figuring out more. Thank you for wonderful information I used to be looking for this info for my mission. Hey this is kind of of off topic but I was wondering if blogs use WYSIWYG editors or if you have to manually code with HTML. I'm starting a blog soon but have no coding experience so I wanted to get advice from someone with experience. Any help would be greatly appreciated! Thank you for sharing the realistic tips here on your blog. visit <a href="https://tiaratech.com/web-design-company">web design company in eluru</a>for more new ideas, we are thankful for this article. Thank you for sharing the realistic tips here on your blog. visit web design company in elurufor more new ideas, we are thankful for this article. Hello to every body, it's my first pay a visit of this blog; this web site carries awesome and really fine data in favor of visitors.